I haven't been to Japan, but I smell like it, now. As I type this, I'm covered in buckwheat flour, there's cornstarch all over my kitchen floor, and there's an Octopus arm simmering away in a pot of fragrant oil, garlic, thyme and chili peppers on my stove. I never thought I'd say this, but I can't wait to eat a bowl full of cold noodles and a fork full of cephalopod mollusc. Now, before you check the header on this page to see if you hit the wrong blog, stay with me a moment. I've been lucky enough to advance to the next round of the Foodbuzz Next Food Blog Star challenge and this one requires us to cook something out of our usual comfort zone. I know. I know! Scary, huh? The good news is that I LOVE to be knocked out of my comfort zone - it keeps my pulse popping, my mind spinning and my husband in shock. So, let me take you along with me and suddenly you'll feel more comfortable too. Soba - means buckwheat, but is also a classic noodle that is eaten cold or hot depending on the weather and desire. The Soba noodles came about because buckwheat can be grown even in times of famine and bad weather. It's a hearty crop and one of the things I respect about it is the poor, humble and resourceful history of its evolution. Soba-yu - is the cooking water left over from boiling the Soba noodles and is used to flavor a dipping sauce or other cooking. Like the Italians, the pasta water is never wasted. Dashi- is Japanese stock that is very simply made by adding Bonito (dried fish flakes) and sometimes Konbu (dried seaweed) to water, then strained. This stock, used like chicken stock and veggie stock in other cultures, creates a rich base for other dishes. Japanese food is one of my favorite choices for dining out, and yet, except for sushi, and one Soba class, I've never really cooked anything authentically Japanese. Did I say Soba class? Here's where the story goes down hill faster than a snowball on Mt. Fuji. The "stretch into another culture" moment of this experience for me was supposed to be the Octopus Confit. I figured, hey - I took a Soba class and did great - so no problem - I'll just whip up a few Soba noodles, throw'em into a pot and concentrate on my tentacled task. Here's the first try: it didn't get very far because it didn't hold together. Here's the second try: it held together, but there was no way it was rolling out. At one point I thought I could probably take a handful of Rock Quarry clay and knead it into noodle dough easier than this. I recalled how it felt that day to be in his studio with he and Sonoko. He is a master, and like all master's - the better THEY are, the easier it appears to copy them. Chef Inouye's arms and hands whirled the buckwheat flour around a giant silver bowl and with an exact measure of water, and determined kneading, turned a grainy, almost gluten-free pile of powder into a smooth, elasticized orb. Using just a long broom handle-like rolling pin, he transformed the orb into a thin blanket. Then, while speaking to us, cut that folded blanket into piano strings of noodles. I did it too. We were all successful...that day... in his studio...with his guidance. Meanwhile, finally on my third try: I GOT SOBA! Ok, no one will be calling me Sensei Showfood Chef very soon. But they taste great! The dough rolled out, it cut into noodles and they stayed together in the water. Well, it is the simplest thing ever. And it tastes like chicken (I'm kidding.) It is moist inside, with a chew like lobster but milder, and a hint of smokey crunch. I'll definitely cook it again. Place Octopus in saucepan with enough oil to cover. Add all other ingredients and bring to a slow, low simmer. Keep simmer low, around 190F until the Octopus is tender when tested with a knife (about 20 minutes). Remove and cool to room temp. Garnish with drizzle of soy sauce and lime juice. May be served warm or cold. To go along with my tasting I made a basic dipping sauce for Soba, which is also extremely easy and has a nice tangy/sweet flavor. Bring the water to boil in a saucepan, then add all other ingredients. Simmer and stir to dissolve sugar for about 5 minutes. Cool and adjust seasonings. Boil Soba in plenty of boiling water for about 90 seconds. Drain and plunge into a cold ice bath, then drain again. Reserve soba water for using in broths and dips. I hope you'll try the Soba noodles because what mine lacked in beauty they made up for in taste and healthy nourishment. And, definitely make the Octopus Confit - it's too easy to pass up. My grandma used to say (when we were crying about a bug we'd turned into our own private pet, but it wasn't moving), "Shake the jar, maybe he's just bored!" Don't get bored, shake your jar, get Octopus and cook it...Japanese style. This challenge is so much fun - if you feel inclined, vote for me to continue by clicking on my profile below: Thank you so much! Great job Cathy! And now I want some octopus. . .
Ooh- great idea! I may have to try this sous vide- bet it would work wonders on those delicious tentacles. This is one of the mist inventive posts I've read- love it. Wow!! Beautiful photos and beautifully written!! I've yet to try either dish but with your great tutorial I bet I could pull it off!! Good luck in this round! A fun read and great entry. Good luck. MMMmmmmm Looks really good. I never knew an octopus could look so pretty. You are a true artist. Congrats!!! Cheryl: Thanks! I think it'll become a regular here. SaltySeattle: Sous Vide sounds like an amazing idea. I'd love to hear about it and how long it took. CG: Thank you so much, it was a beautiful Octopus...tentacle. And you too! Nancy: You are so great! It was great to see you. THis was really tasty - hope you try it. Foodalogue: Thanx! And you too! Anonymous: Nice compliment, thank you! A lovely post that certainly deserve to advance in Project Food Blog. I love anything octopus, so you got my vote. Congrats on the Soba! Wow, a very impressive selection --Different and amazing photos too. Good luck in the competition! Holy Moly! I love that you took this challenge to such great heights! The noodles look absolutely perfect :) And I'm glad I discovered your blog as a result of PFB. You've definitely got my vote! Cathy, I just spent a bit of time looking over your archives. A very impressive body of work. I am (optimistically) working on my menu now for the dinner party next challenge, and am looking at several of your posts as possible dishes. I have some grapes soaking in bourbon as we speak, and will be posting those (with the pecan-goat cheese tomorrow. Wow!! You look like you are already a professional. Not sure I would be so adventurous - the octopus, not the soba seems pretty daunting. you get my vote for being so adventurous! Never cooked octopus in olive oil before! You have my vote! I also wanted to try making soba, and now I can thanks for the recipe! Great post and beautiful pictures. You got my vote, good luck! How interesting/funny that the dish you thought would be a breeze was the real challenge. Meanwhile, poaching octopus in olive oil seems like a walk in the park! Great post! Hi Cathy, You're more adventurous than I am! I don't eat anything that starts with "te" and ends in "cle"! 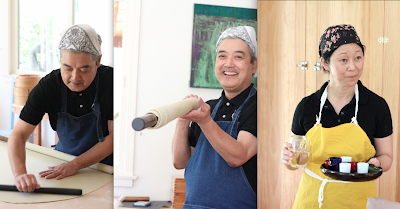 But I love soba and so enjoyed your photos and account of soba-making. And if I ever did eat octopus I'd definitely want to follow it with something yummy like your chocolate kiwi popsicles. Wish we'd had a chance to chat at camp on Saturday. Homemade soba - wow! I love soba noodles and yours look fantastic. Way to go out of your comfort zone! I can only imagine that if I tried to make soba, my efforts would have been like your first 2 attempts :) Great job all 'round. The best meals often make the biggest messes. I love seeing mistake photos, it makes the final product that much more rewarding to read about. Your octopus confit gets my vote. Can't wait to see what's next! I want this and I want it tonight! Somebody made a pilgrimage to Uwajimaya - I think I have a photo of the original whole octopus that arm came off of. :-D This is spectacular, Cathy! I'm especially impressed with your soba - one of my very favorite foods. Voting! Wow. Homemade soba noodles AND octopus. You have my vote. Best of luck to you in the contest. Authentic Tokyo soba proportions! Love it. This sounds awesome, I voted for you. Of COURSE, it tastes like chicken! Ok, you've inspired me to make soba. I've made a lot of vegan pasta, but I didn't know this one was naturally eggless. Thanks for the hint.